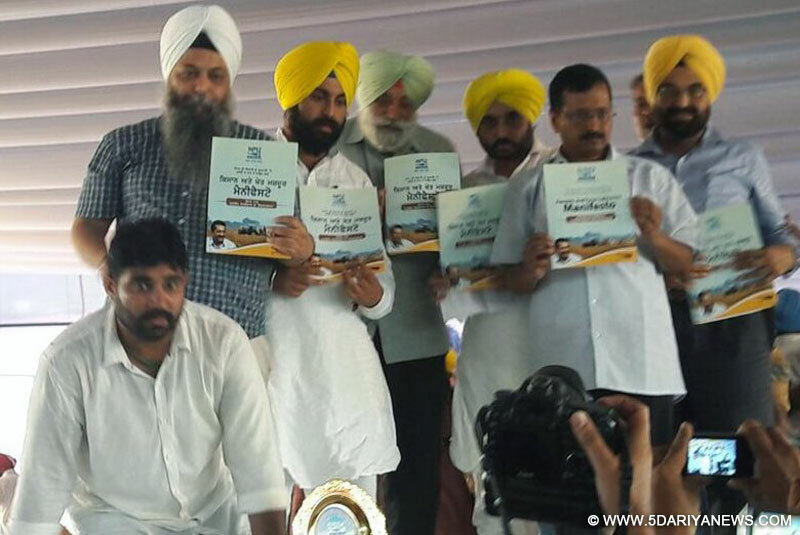 Aiming to target a major vote bank in the state, the Aam Aadmi Party (AAP) on Sunday promised to make farmers in Punjab debt free by end of 2018 if the party was voted to power in assembly elections early next year.AAP convener and Delhi Chief Minister Arvind Kejriwal, who released the Kisan (farmer) manifesto of AAP in this Punjab town in Moga district, said the party will implement the Swaminathan Panel report on agriculture and ensure that no more farmers in the 'Green Revolution' state committed suicide.Kejriwal was flanked by AAP Punjab convener, comedian-turned-politician Gurpreet Ghuggi, and AAP MPs from Punjab, Bhagwant Mann and Sadhu Singh.The AAP Kisan manifesto promised to pay a compensation of Rs 20,000 per acre if their crop was damaged due to natural calamity. It promised compensation for farm labourers and said that property of farmers will not be confiscated or attached in default of payment of loans. It also promised 12-hour uninterrupted power supply free of cost to farmers. Addressing the rally, Kejriwal said that Punjab's ruling Badal family and the Shiromani Akali Dal, which has been in power in Punjab in an alliance with the Bharatiya Janata Party (BJP) since 2007, had ruined the farmers of the once progressive state.He said that Akali Dal leaders would be put behind bars and their properties confiscated for indulging in large-scale corruption in Punjab.The AAP, which has witnessed internal crisis in its Punjab unit in the past one month, is trying to revive itself to pose a challenge to the Akali Dal-BJP alliance and the opposition Congress.Kejriwal arrived here on Thursday for a four-day political tour to revive the party's fortunes.